Last week Alexis Petru interviewed me for her article 5 Simple Ways to Start Growing Edibles for Earth911 and the post got picked up by the Huffington Post. 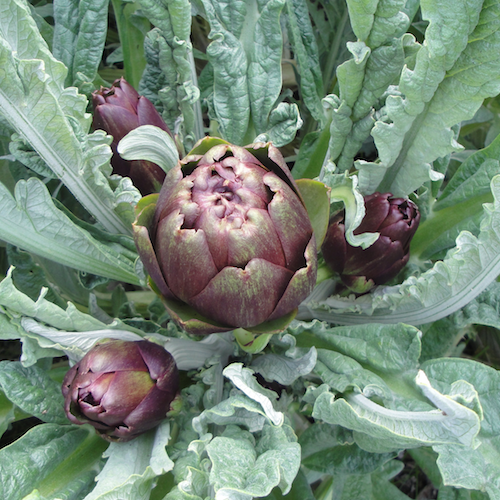 I love to see that people are excited about growing their own beautiful food to share with family and friends. And it's not that we have to grow everything we eat to feel good about edible gardening - I still love my weekly trip to the farmer's market and I know that our small local growers value my support. So take advantage of the season and go get dirty! Eating fresh organically grown potatoes will spoil you, and there are many delicious varieties you can find at your farmer’s market and a few grocery stores. They come in a range of colors: purple, bluish, rosy red and gold colored. 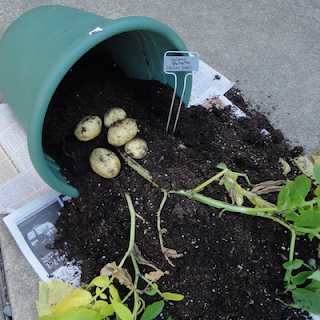 If you’d like to try growing your own, here’s a really easy and fun way to grow your favorites in a container at home. I tried a Yukon Gold, above, and a Russian Banana that I haven't harvested yet. I collected both of these at my Farmer's Market. 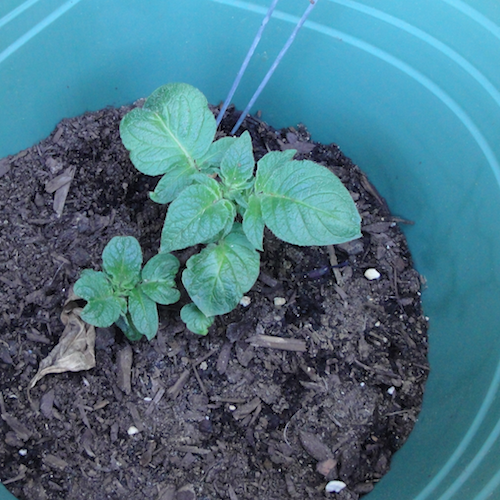 You don’t have to have special seed potatoes, if your potato sprouts, it will grow. It helps if it’s fresh and hasn’t been in storage for a long time, or sprayed with any sprout inhibitors. That’s why getting them from a local organic grower is advisable, if you can. You can also order seed potatoes from Wood Prairie Farm or Seed Savers Exchange. 2. 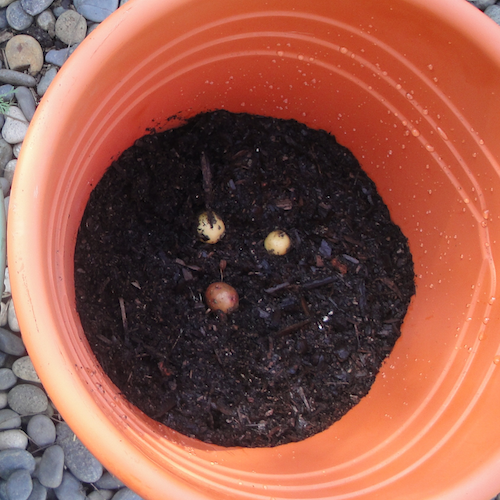 Mix in a small handful of organic fertilizer, such as Dr. Earth or EB Stone. 3. Place a sprouted potato in the center and cover with about 2 inches more of the potting soil. 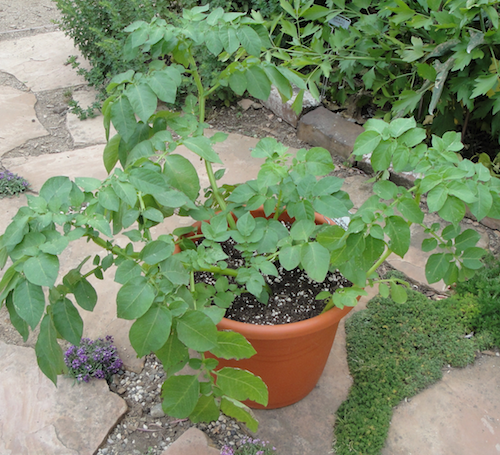 When the plants are about 6 inches in height, add more soil up to the leaves. Do this until the container is full with soil up to the rim. Water the container and allow the plant to grow. Harvest the potatoes when flowers begin to open or the foliage begins to die back. Genuinely heirloom seeds are seeds with stories. They were passed down through generations of families and communities. Typically, they traveled long distances with immigrants to new lands as cherished food plants. These traditional sources of food were a comfort, and beyond that, a necessity. In our urban supermarket and fast-food culture it’s easy to forget that at one time families relied on what they could grow, and the crops they grew were a rainbow of diversity. What happens to these unique varieties of edibles when there is no one to grow them and pass seeds on to the next generation? Extinction. Many have already been lost, but there are heroic efforts underway to save as many as possible, along with their stories. For example, I love the story of the Collier Cucumber, named after a family who began growing it in about 1910, after being given seeds by traveling gypsies. Seed sleuth Sara Straate, was able to collect information through interviews with the Collier children. 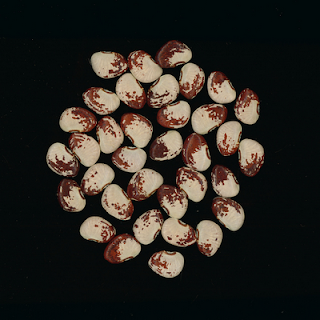 Straate, who is a Seed Historian with Seed Savers Exchange (SSE), learned that in the 1950’s the parents had planted all of the seeds they had. As fate (and weather) would have it, the entire crop failed. The family was crushed to have lost this much-loved cucumber, which they ate fresh and pickled. Remarkably, a single plant came up the next year from a seed that survived in the ground. The father diligently protected it and was able to save the variety. Through an ambitious project called CORE, the Collection Origins Research Effort, Seed Savers Exchange (SSE), the largest seed saving organization in the United States, is gathering, verifying, and filling in the gaps in the stories behind the thousands of heirloom seeds that they are entrusted with safekeeping. Many of the seeds they have received are accompanied by background information, but it is often incomplete or consists of letters that are difficult to decipher. It’s Straate’s job to follow up on any gaps or inconsistencies in their records and attempt to reconnect with donors who have ties to and memories of these seeds. Sometimes the historical information on file is handwritten and leads to misinterpretation. SSE has in their collection a 'Grandma Storrt's Speckled’ lima. This is a lima bean that SSE received as a donation in 1989 from a 70 year-old woman in California who was afraid it would be lost (it wasn’t growing well there). The lima had been cultivated by her family in Missouri since the 1800’s. It had been a reliable and hardy source of food, even when all else dried up in the garden. Misinterpretation of her letter led to the name Storrt's. Straate was able to confirm that the proper name is 'Grandma Stout's Speckled’ lima by recruiting the help of the Historical Society in Johnson County, Missouri, to aid in tracing the family. My own fascination with growing and eating heirlooms led me to join SSE’s Member Grower Evaluation Network (M-GEN). 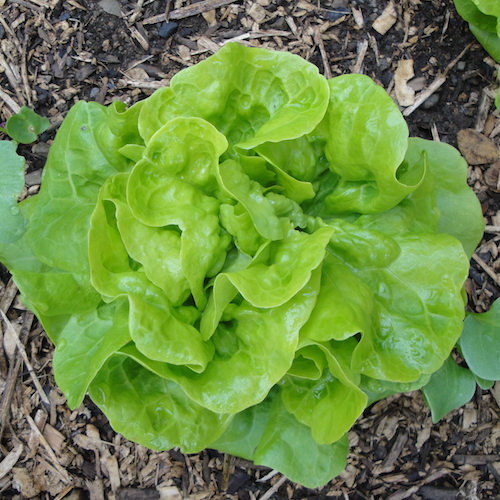 I’m currently growing ‘Three Heart’ lettuce to provide cultivation data to the organization, which relies on member participation. I admit that it appeals to my romantic nature, and as a gardener, the opportunity to grow a rare, special variety is too enticing to pass up. ‘Three Heart’ is still grown today by a few members of the older generation of the Apostolic Christian Church, a small denomination of under 100 congregations worldwide". SSE has long recognized that the stories that accompany these seeds are precious historical gems, as well as important for understanding the food plants themselves (cultivation requirements, uses, etc.). SSE co-founder Diane Ott Whealey chronicles this in her engaging book Gathering, the story of how she and her husband safeguarded not only heirloom seeds, but the accompanying tales that came with them. It’s been over 35 years since the founding of the organization and the collection now numbers in the thousands. Straate will be busy for a very, very long time. 1. Improved quality of information associated with each variety in the collection, enabling better utilization of its biological and historical value. 2. An enhanced understanding of the practice of seed saving, including its cultural, familial, and agricultural implications. 3. Identification of varieties most in need of preservation and promotion. For more information about the CORE Project click here. This post was also published on Eat Drink Better. Grandma Stout’s Speckled Lima courtesy of Seed Savers Exchange. A cup of fragrant herb tea is a natural choice when you want to avoid caffeine. And best of all, you can grow a variety of wonderfully scented herbs in your garden or in containers. 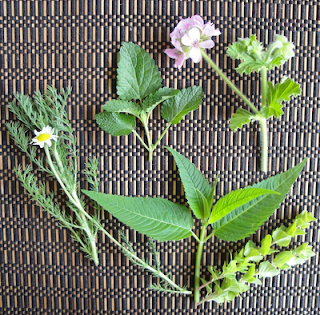 Create an herbal tea garden and snip off a couple of fresh sprigs whenever you want a comforting cup of tea. You can also dry your herbs and keep them for winter use in airtight containers and to give as gifts. Your garden will come alive with their spicy scents and with appreciative wildlife. 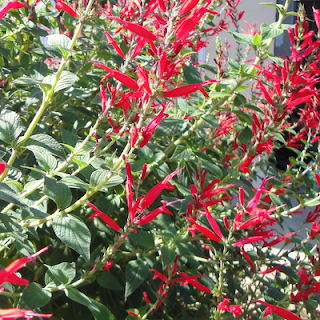 Bees, hummingbirds and butterflies love the flowers of many herbs. It's a pleasure to rub the leaves and enjoy a whiff of all the different perfumes while working in the garden. Many will do well potted into containers for your porch or patio. 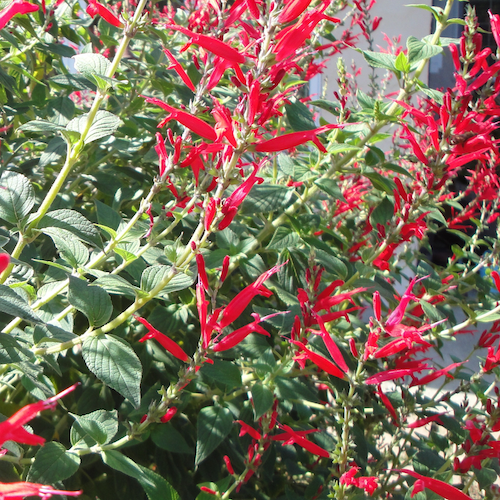 Some of my favorites are: lemon verbena, bee balm, chamomile, scented geraniums, catnip (aka, catmint), pineapple sage, and lemon balm. I recently found a lemon-scented catmint at a local nursery that I've added to my herb garden. 1. Use a non-metal tea pot to preserve the true flavors. 2. For hot tea use 2 tablespoons of fresh herbs or 1 tablespoon of dry per cup of water. 3. For iced tea use 3 tablespoons of fresh herbs or 2 tablespoon of dry per cup of water (to allow for ice cubes). 4. Bring water to a boil, then pour over the herbs in the tea pot; cover to steep. 5. Steep for at least 5 minutes, test for taste, steep longer if desired. Serve with honey, lemon or orange slices, or sprigs of fresh herbs. I like to add a dab of honey to both hot and iced tea. For iced tea add the honey before chilling the tea so it will dissolve. You can use your herbs for hot or iced tea. Brew them in combinations or try flavoring a cup of green tea with lemon verbena or bee balm. Iced green tea is really good flavored this way- have you noticed the trendy ice tea drinks sold in nice glass bottles? You can make your own, just flavor it with a bit of honey while it's still hot, chill it, and enjoy. The pleasant ritual of brewing tea and enjoying a couple of cups from my teapot is very soothing. If you don’t have a teapot you can brew your tea right in your cup, just cover it while it’s steeping and strain out the herbs by pouring it into another cup to drink. Then keep an eye out at garage sales or pottery sales for interesting teapots to collect and enjoy a daily herbal tea ritual. I love nasturtiums not only for their vibrant bright colors and unusual saucer-like foliage, there is simply so much to love: they grow easily and reseed themselves every year, plus their leaves, flowers, and seed pods are all edible. I often sprinkle the flower petals on our salads to add gorgeous color and I’ve been adding the young leaves for a bit of peppery zest. The green seed pods (pictured above) are crunchy and surprisingly peppery too- try one right off the plant, but you have been warned! You can find lots of recipes for pickling them to use in place of capers since this has been done for literally centuries. I found a recipe in The Forgotten Art of Growing Gardening and Cooking with Herbs, by RichardM. Bacon, (Yankee INC, 1972). It’s a wonderful book I discovered recently at my local used bookstore, packed with useful information. The instructions are minimal: in a quart jar combine 1 tablespoon salt, 2 cups wine vinegar, 1 clove of garlic. 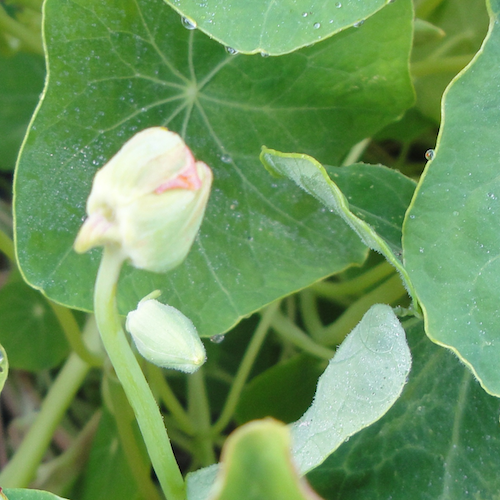 Fill with green nasturtium pods, seal, and store 1 month before using. 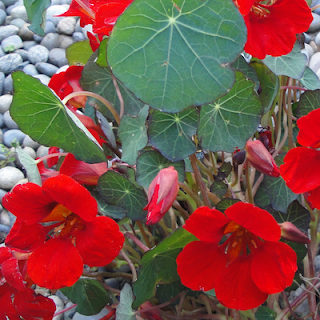 But I challenge anyone to find enough nasturtium pods to fill an entire quart jar- then to actually use them! So I found Linda Ziedrich's method much more doable. She 's the author of The Joy of Pickling. She combines 1/2 cup cider vinegar and 1/2 teaspoon salt in a small jar, stirs to dissolve the salt, and adds the green pods. She has even added fresh pods to the jar throughout the growing season. She doesn't refrigerate the jar, but personally, I'm cautious, so I'd refrigerate them just to be on the safe side. 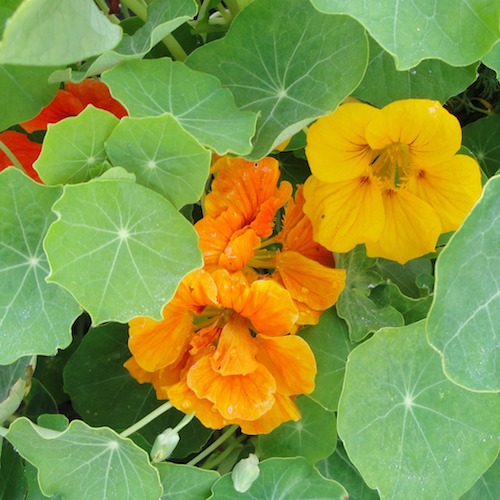 Do you have a favorite nasturtium recipe? I'd like to know- I have lots of them growing! I refuse to use pesticides in my garden- it’s not worth the damage to the environment. But at this time of year when I’m planting the tender, defenseless seedlings that I carefully nurtured from precious seeds, I get desperate. Snails will mow down seedlings in the blink of an eye. I’ve used Sluggo, which helps but is variable in effectiveness. 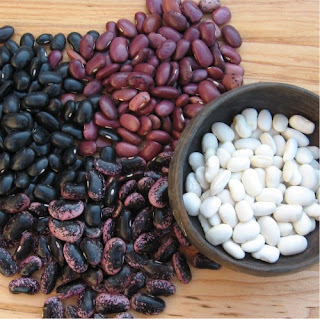 The active ingredient is iron phosphate, safe for use around pets and wildlife and sanctioned for organic gardening, but using too much may cause phosphate build up in the soil. So I turned to my secret weapon: copper foil. I’ve used small copper foil strips to protect young plants that I’m trying to establish in my garden until they have a chance to mature and can stand on their own against snails. It’s 100% effective in my experience. But I hadn’t thought of wrapping my planting beds in the stuff - until I saw it in a slide show by Maureen Decombe of Green Willow Gardens. 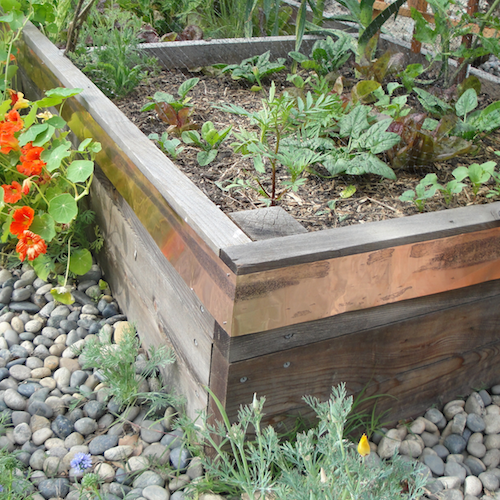 My organic garden supply store, Common Ground in Palo Alto, has copper strips for sale to use as snail barriers - they are worth every penny! I bought 40 feet and immediately wrapped two of my front yard beds. “It is believed that copper barriers are effective because the copper reacts with the slime that snails and slugs secrete, causing a disruption in their nervous system similar to an electric shock." 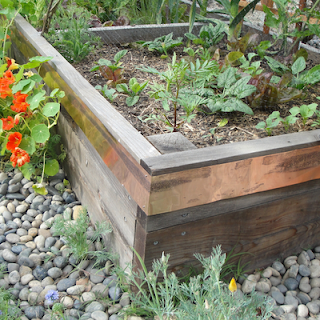 The copper barrier is supposed to be effective for several years, and can be refreshed with vinegar if it tarnishes. 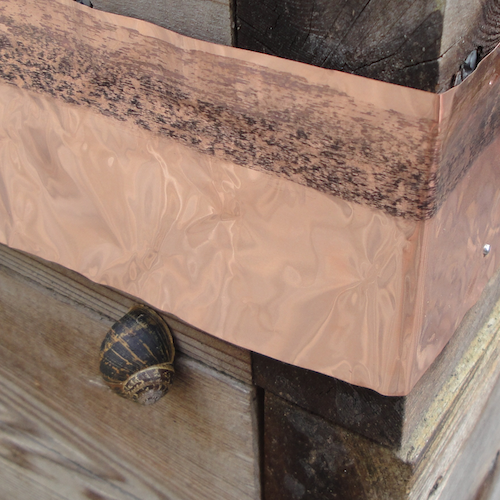 My copper, show in the photos, is 4 inches wide which is a good width for a snail barrier. I'll still go out and handpick them to keep them from eating the rest of my garden, but I'm enjoying this small victory!